Panaji, Goa: One of India’s most influential artistic lives of the 20th century came to an end in Loutolim, Goa, on Sunday, when Mario de Miranda died in his ancestral manor at the age of 85. Almost until the very end, he was still in full creative flow: turning out inimitable, zesty drawings to burgeon a genuinely monumental legacy that began with a saucy can-can scene commissioned by Dosoo Karaka for The Current in 1953. Still in his 20s, Mario, had quickly become established as one of India’s best illustrators. His images then remained ubiquitous across the Indian media right into the 21st century. 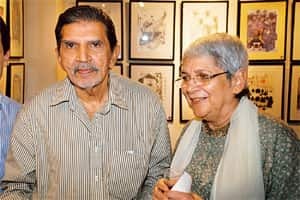 His cartoons of top-heavy secretaries, flirtatious sardarjis and bumbling bureaucrats charmed readers across India; and creations such as Miss Nimbupani and Miss Fonseca appeared on a regular basis in Femina, The Economic Times and The Illustrated Weekly of India. Some of these works also adorn iconic venues such as Panjim’s municipal market and Mumbai’s Cafe Mondegar. That very popularity was a kind of undoing, however, because Miranda’s artwork never wound up receiving the serious critical recognition it merits. Even worse, he was always extremely unjustly compensated, and like his close friend of many decades, the seminal Indian modernist Francis Newton Souza, Miranda was ripped off and exploited constantly, enduring difficult financial straits at the end of his life. Until quite recently, we understood there were three clearly delineated phases to Mario de Miranda’s career. The first began at The Current, and flowered marvellously at the Times Group of publications in the 1960s. By this time, the shy, handsome Goan aristocrat had met and married Habiba Hydari from one of the noble families of Hyderabad. The young couple soon were at the centre of a cosmopolitan Bombay universe quite unlike anything that had come before. Just as his friend and long-time collaborator, Behram “Busybee" Contractor’s gentle columns came to define the gently swinging Bombay of the times, Mario’s exuberant full-page illustrations in The Illustrated Weekly—and later, The Afternoon—served it all up with a broad wink, no punchline necessary. Everyone laughed, without exception. Even years shy of my 10th birthday, I vividly recall cracking up no end to Mario’s full-page drawings of cocktail parties and dances, so delightfully chock-full of zaniness and sly observations. A major artistic development took place when Miranda started to travel abroad regularly in the 1970s, and began to build considerably more ambitious suites of work based on his foreign observations. The critic Ranjit Hoskote has written, “Mario is a master of the meticulously detailed and gorgeously proposed urbanscape." Now freed of space constraints, deadlines and editorial interference, Miranda began to compile immensely detailed observations of Lisbon, Jerusalem, Macau, New York, Paris (and many other cities), a wonderful and unique body of Indian travel journalism that has yet to find proper understanding or recognition. It’s clear he wanted to move beyond the daily cartoon regime, but that opportunity never quite arrived. The third major phase of Miranda’s life and work deals with Goa. It is simply a fact that he produced by far the largest and most influential body of images of Goa of any artist in history. Francis Newton Souza did execute unquestionable masterpieces, but they’re trumped by the sheer ubiquity of Mario’s drawings. To Goans of my generation (I was born in 1968), it is the Miranda vision of Goa that occupies the mind’s eye when we think of any number of iconic scenes, themes, or even individuals. But what is less understood is his and Habiba’s tireless, generally thankless advocacy for the rich, complex and confluential art and culture of the state. It was a lifelong motivation. It may be hard to imagine that an artist so widely beloved, for so very long, still had something left to surprise. But this is indeed the case with Miranda, and an unseen part of his artistic legacy that has only come recently to light. These are the remarkable visual diaries that the young artist kept from 1949-1952, years he spent at home in Goa after the sudden death of his father. Mario never attended art school, but had always been a prodigious?caricaturist. ?Now he started to fill leaves of an unlined notebook with observations of village life in Loutolim. We see an impressive turn to narrative, probably after coming into contact with American comics. Now he’s on to something, and we see hard work and ambition shine from each successive page. It is immensely moving to see this young, untrained Goan boy dramatically raise the bar for himself, working away in isolation. And so by 1951, a brand new truth trumpets itself from almost every page: Miranda had already become one of the greatest, most unique illustrators of the 20th century. There is no doubt in my mind that this will be a widely accepted fact before too long. Vivek Menezes is a writer and photographer based in Goa.